I wonder if this game will use sprite models or 3d, if they choose to use sprites, I hope that it will be in high resolution and capable to withstand modern monitors, up to 27" at least. From current information 2D backgrounds with 3D charachters. How *exactly* though we'll see with the first screenshots. Hmmmm...Saudi Arabian guys? Doesnt see that paralell. Edited by l3loodangel, 18 September 2012 - 02:20 AM. Shame Onyx is out of the picture. I thought it was a rather neat little engine, with some pretty impressive visuals. Has the game's engine been announced yet? Will it be IE? Now you guys are making me want to play IWD again. Well, games always seem more fun after the 6th playthrough. Shame Onyx is out of the picture. One of the devs stated they probably would not be using Onyx because the "middleware" is too expensive. I see the similarites, but I think you're overreacting. I think we can reasonably assume that it's a concept for just one of the cultures or regions in PE's world, and I don't see why designs like this would be a problem. BG2 (which you used as an example) used a bunch of different styles as well between the races and groups you encountered -- the Djinn and Rakshasa had similar arabic-influenced designs, the vampires had an egyptian vibe to them, the pirates and seafarers did the whole puffy shirts and pants thing... It adds diversity. In the video, you can see even more of those sketches. The variety in the video does not even show all of the sketches that our artist did. She tried out a variety of styles and levels of dress. It's a high-level, low-detail pass on character ideas. Edited by l3loodangel, 18 September 2012 - 06:04 AM. 1.) Cain: "We have an engine already..."
2.) Josh is project lead, Cain is prog and mechs, Chris will "be doing writing on this project" (unclear to what extent that means). 3.) They are interested in doing multiplayer but unsure if they can swing it. 4.) Cain: "[PE] will have guns"
We will be doing an update on the technology of P:E, but in brief, the firearms of this world are relatively recent inventions and equivalent to the single-shot wheellock weapons found in 16th century Europe. Their use is uncommon and for specific purposes. Sounds nice. Like a lot of the world building, enough to spice it up while still feeling familiar. Does that mean there will be muskets in the game, or is it all just a terrible, terrible mistake? How are muskets a mistake? It isn't in the first place. I think that was his point, that a lot of people are complaining about things because it's not how Baldur's Gate or the other D&D games did it. I dont see it that way, not that much at least. 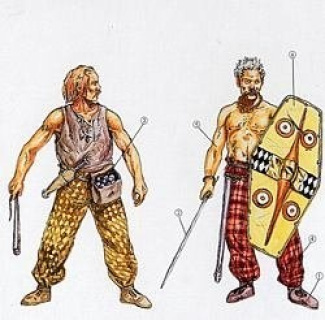 Some might be oriental stylised but is basically Gaul Celt http://cdn2.fishpond.../9883044/4.jpeg armored with stylised Roman Lorica Segmenta http://www.armsandar... segmentata.jpg and armed with a musket. So I am not sure what is your point? Dislike for the gun or that you see oriental influences where they might not even be? Edited by Tauron, 18 September 2012 - 11:35 AM. Honestly, GJ to OP for info gathering, the total picture gets clearer and bigger this way. EDIT Argh, there's a seperate Update 3 topic, nvmind. Edited by IEfan, 18 September 2012 - 12:31 PM. (the 2nd Ed Php did have arquebus weapons but no one used them)"
People did use them. Why do you talk for others? I had campaigns make use of them. I hope not. I do not want another DnD RPG and have to cheese around with multiclassing instead of just making the character I want to play. I'm also pretty tired of playing in worlds where 16th century plate armor is commonplace but firearms are either unheard of or just a niche gnome weapon. I think Obsidian has been pretty upfront that this is not using either the D&D license or d20 mechanics. They've said from the beginning that they'll be making the game with their own rules system. Additionally, given Obsidian's track record, I'd say it's fair to say the game will try to subvert several expectations about the genre (both as an RPG and a fantasy game).